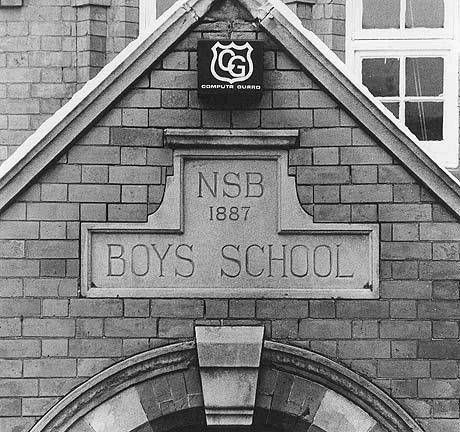 Entrance to the old Lenton Boys School, at the junction of Lenton Boulevard and Sherwin Road. 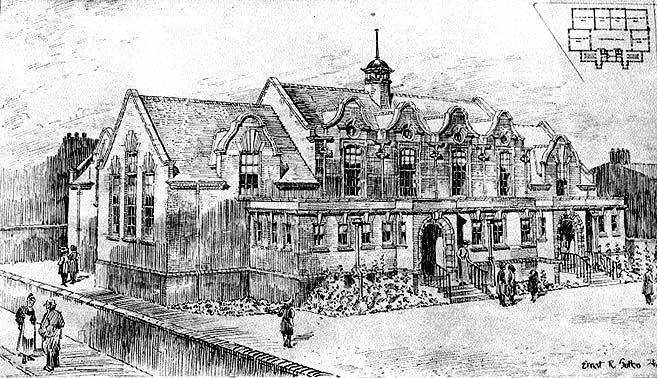 The architect's drawing for Lenton Girls School. 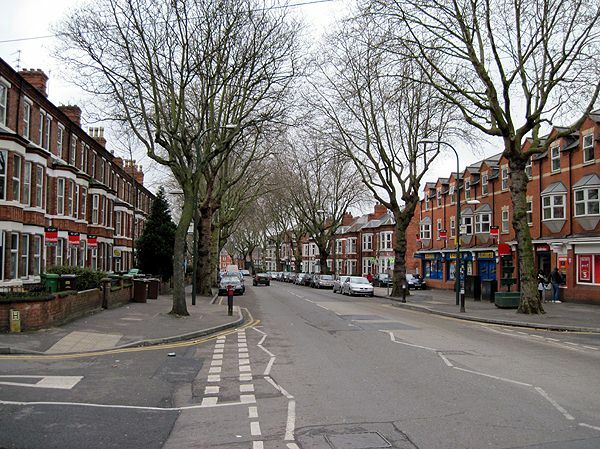 2005 view of Lenton Boulevard taken from its junction with Osmaston Street and looking towards the junction with Castle Boulevard and Sherwin Road. 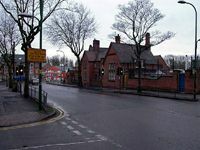 The school complex on the other side of the road is Lenton Primary School although part of the building facing on to Lenton Boulevard now provides a base for the Dunkirk and Lenton Partnership Forum. Back in 1900, No11 Lenton Boulevard - the property with the stuccoed frontage - was for a short time the home of the James family who are featured in the article in Lenton Times No.26 entitled 'The search for Walter Edwin James'. At one time this person was a professional cricketer - although, at present we know almost nothing about his playing career. 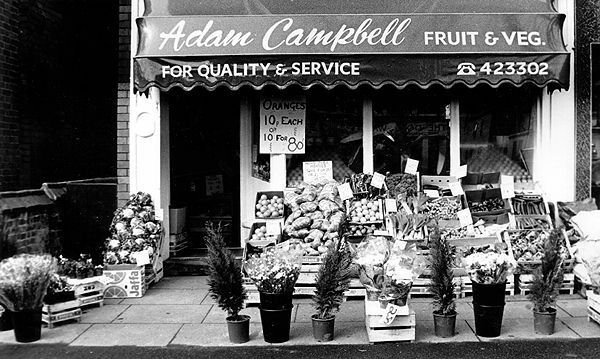 At the beginning of the 1990s Adam Campbell opened a fruit and vegetable shop at 15 Lenton Boulevard. It operated for a number of years but insufficient trade forced its closure and the groundfloor area was then used as a store for items of tool hire belonging to Mitchells, based across the road. The shop shown in the previous photograph is no longer open for business - the security grill remains permanently down, at least for the time being (2010). 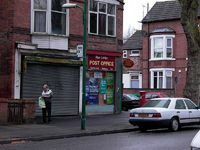 When this photograph of the New Lenton Post Office was taken by John Bridgewater in 2006 it was still open for business. However since then the shop has been closed and although efforts have been made to get the post office reopened, at the time of writing (2010) the campaign has not been successful. 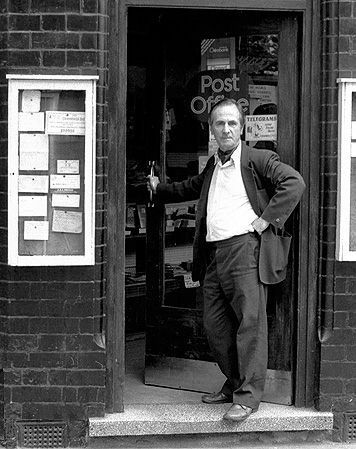 One of the former New Lenton postmasters was Ken Gulliver, shown here standing in the doorway to the shop in a 1987 photograph. 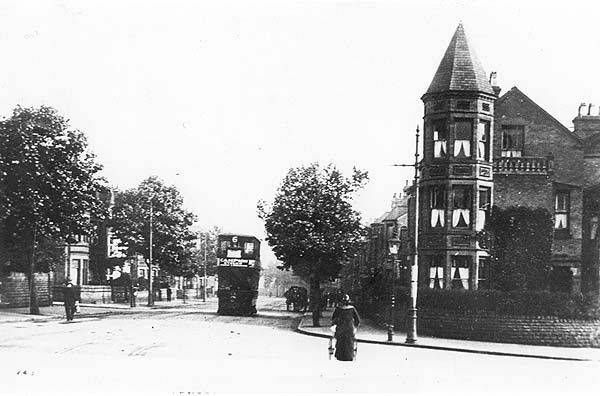 The junction of Lenton Boulevard and Trinity Avenue in the 1920s with New Lenton Post Office on the right and the tower of what was then Lenton Council Infants Department on the left. 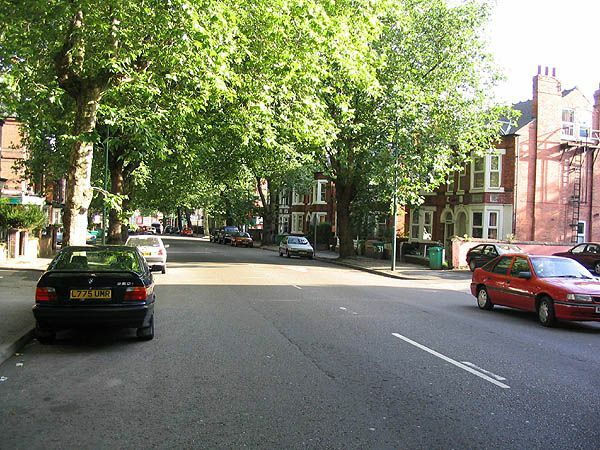 This 2004 photograph focuses on the Boulevard properties between Church Street and Trinity Avenue. But for the foliage on the trees the Post Office shown in the previous photograph should have been visible in the far distance. The site of Lenton Boulevard Petrol Station in October 2000. 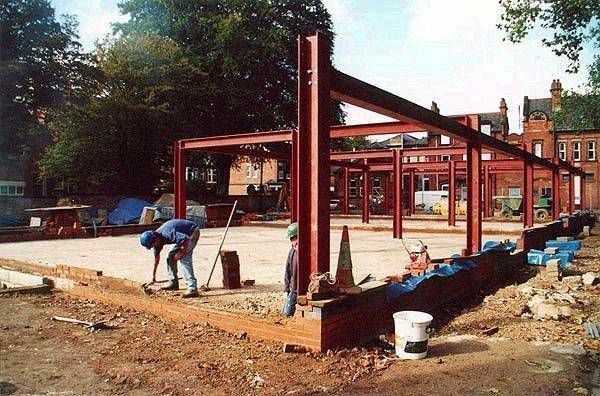 The steel work is being put in for the block of shops on the Boulevard. 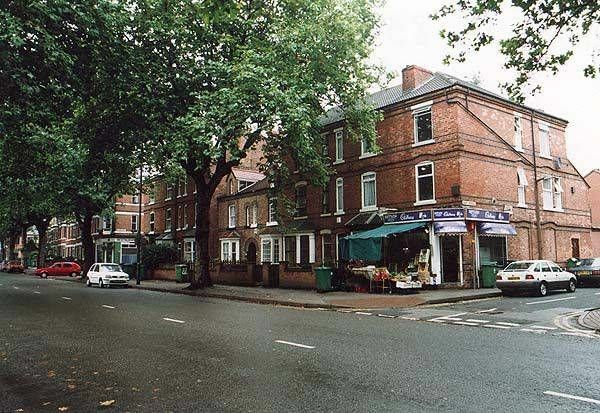 Lenton Boulevard's new block of shops in 2004. The occupants at the time of the photograph are Blockbusters, Ladbrokes, and Jacksons. Ladbrokes had moved there from the old co-op building at the corner of Church Street and Lenton Boulevard. 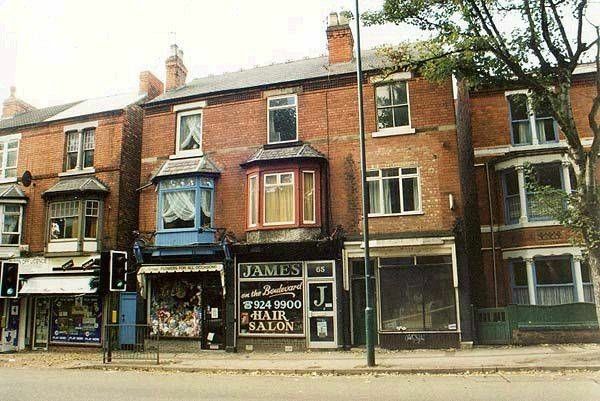 Jacksons, now acquired by Sainsburys, occupy the Church Street end of the block and its arrival meant that other existing shops on Lenton Boulevard found they couldn't compete and simply ceased trading. An undated picture postcard (though probably created in the early 1920s) published by Jack Spree showing the view along Lenton Boulevard on the approach to the junction with Church Street. 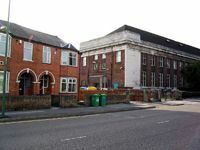 Both the buildings seen either side of the junction are still with us although there have been several changes of use since the building on the left housed the No.2 branch of the Nottingham Co-op and the building on the right was a bank. 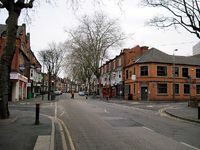 The same view of the junction with Church Street as in the picture postcard shown in the previous shot but this one is taken by Paul Bexon in 2010. Quite by chance Paul has managed to take the shot while someone was using the pedestrian crossing and had reached the same point in the road as shown in the earlier shot. Another early picture postcard of the Church Street junction. 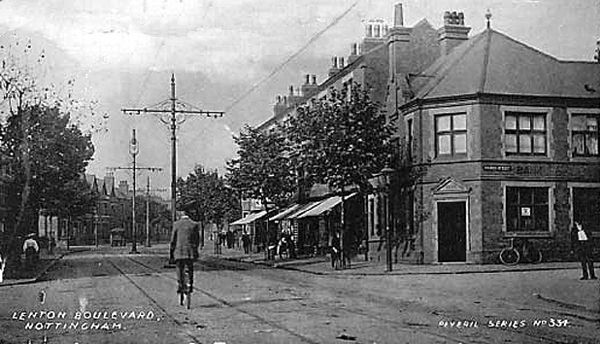 However, it must have been taken slightly earlier than the previous picture postcard; the reason being that the stanchions for the electric tram are still positioned in the middle of the road. These were moved to the side of the road c.1910. 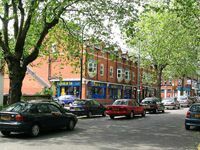 Part of the block of shops at the corner of Lenton Boulevard and Church Street. Photograph taken in 1998. Robinson's sweet shop used to be housed in the shop on the right that was unoccupied at the time of the photograph and up to the present day. 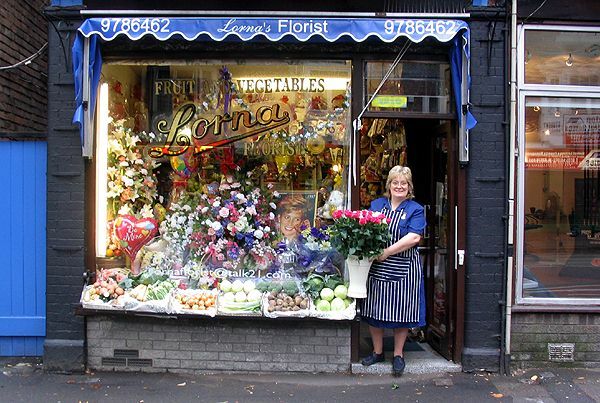 Angela Spencer, the current proprietor of Lorna's florist shop poses for her photograph in 2006. 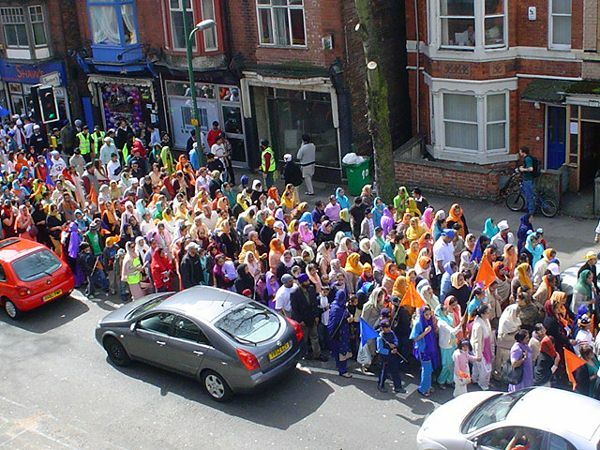 The annual Versaki celebrations in Nottingham involve a procession through the streets as members of the Sikh community make their way to each of the principal gurdwaras in the city. 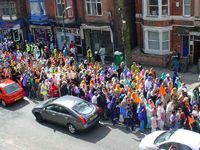 Here part of the procession is seen making its way along Lenton Boulevard in May 2005. More of Jonathan Devlin's photographs can be found at www.flickr.com. 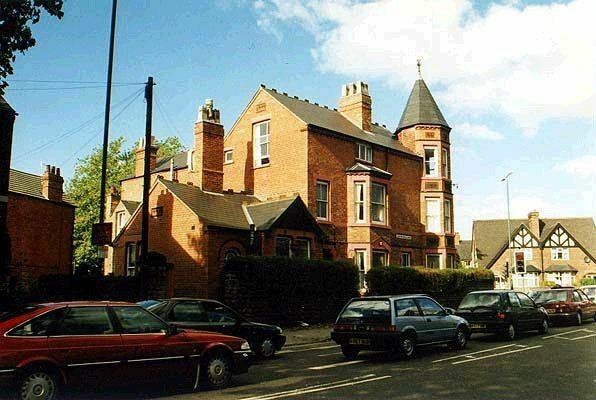 The property at the south west corner of Lenton Boulevard and Derby Road taken in 1998. In the early part of the century it had housed a doctor's surgery. The same building in the early 1900s. 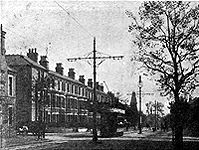 The tram is on its way along the Boulevard to Radford and the terminus on Hartley Road. For more on Lenton and the tram system see Issue No.8. 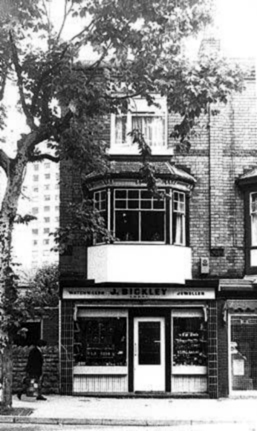 Bickley's the jewellers at 72 Lenton Boulevard in the 1980s. After Jack Bickley's departure the premises were altered for Burrows and Close, the chemists, who moved from across the other side of the road. However, once the new Derby Road Health Centre was opened on the corner of Derby Road and Johnson Road Burrows and Close transferred their business to the new building. Currently  No.72 houses one of the many letting agencies that operate in the Lenton area. See also Lenton Listener Article - The Shop that Jack Built. 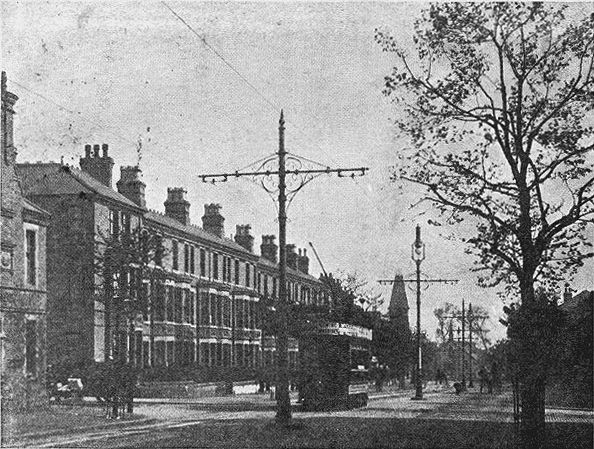 This photograph was one featured in an early series of picture postcards entitled 'Hall's Views of Lenton' which were published about 1904. Looking south along Lenton Boulevard this particular one shows the Church Street junction in the foreground. As with one of the other early shots shown on this page the stanchions for the tram wires are still situated in the middle of the road. 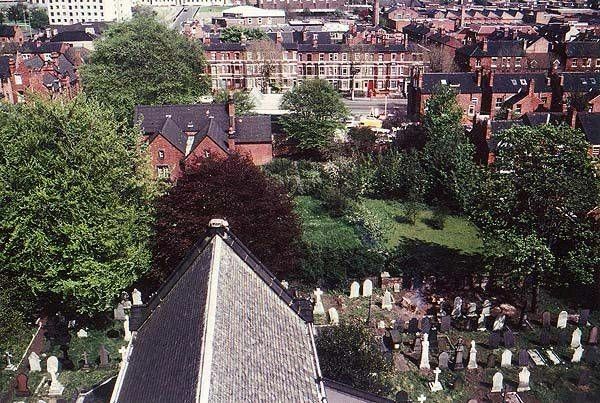 A 1980s view of Lenton Boulevard taken from the tower of Holy Trinity Church. The vicarage garden now houses the new vicarage and the petrol station has since made way for the new shops. 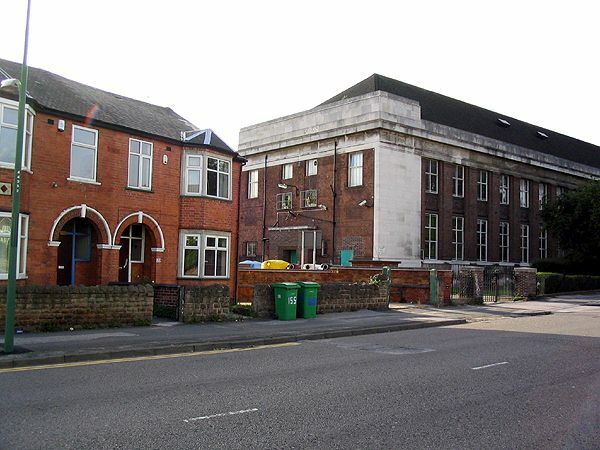 The terrace of properties on Lenton Boulevard shown in the previous shot can be seen in the middle distance. A 2010 shot of the terrace of properties shown in the 1904 picture postcard with the junction with Church Street off to the left. 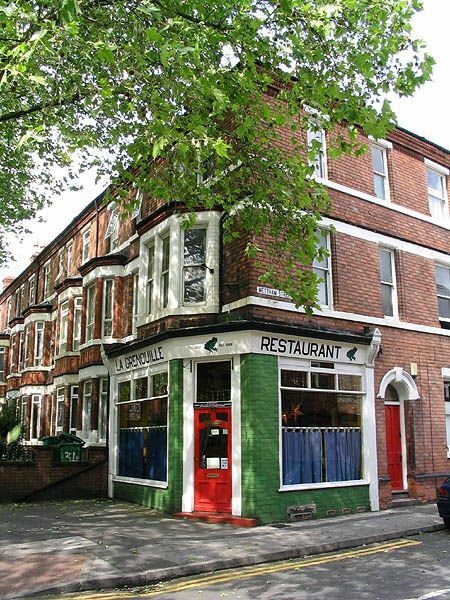 La Grenouille restaurant situated at the corner of Mettham Street and Lenton Boulevard. 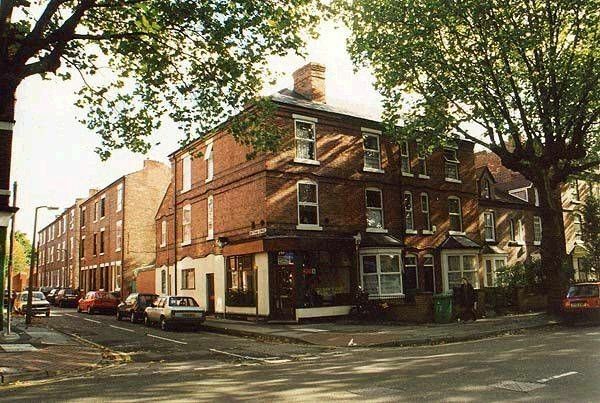 This became an established part of the Lenton scene in the 1980s. 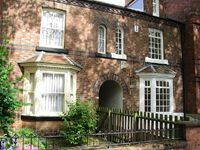 The property is also supposed to be the birth place of Albert Ball VC. Looking much the same as in the previous photograph, taken in 2004, La Grenouille had now changed its name and become an Italian restaurant. 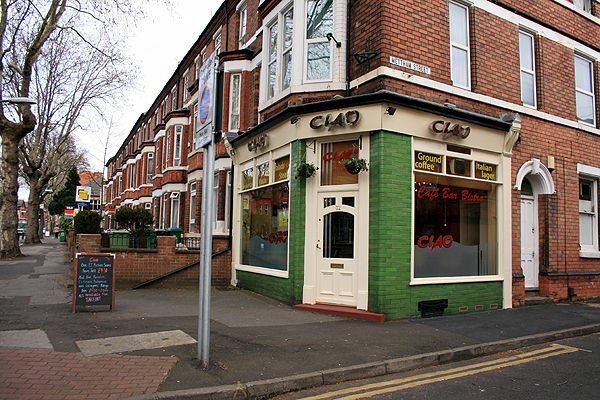 However this establishment was not destined to survive for very long and closed not long after the photograph was taken in 2008. Lenton Boulevard at its junction with Mettham Street . This dinky set of two- storey properties always seem rather dwarfed by the adjacent properties either side of them. In all likelihood these preceded their three-storey neighbours' arrival and were probably constructed soon after School Street (the forerunner of Lenton Boulevard) was constructed in the early 1870s. 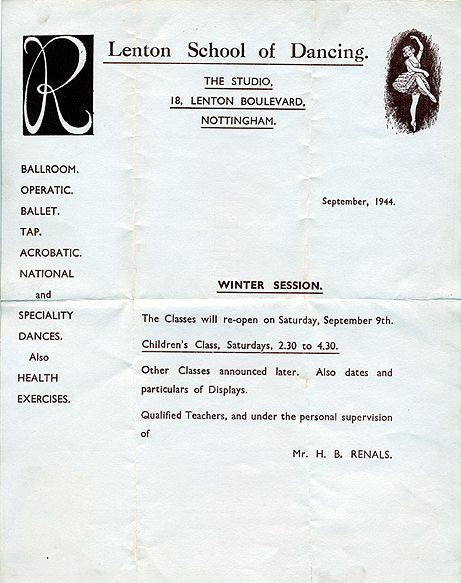 When you access the large version of this you will discover the 'location' of the Lenton School of Dancing. 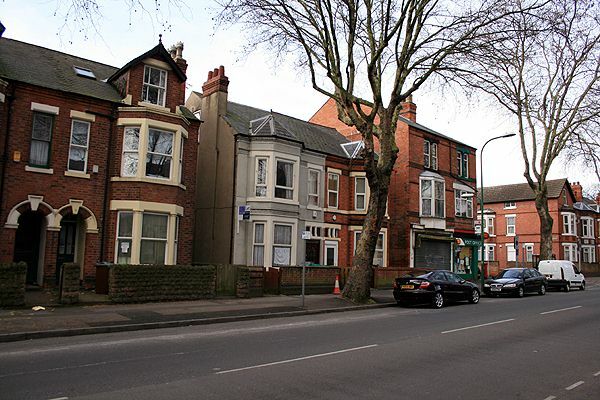 No.18 Lenton Boulevard was in fact the home address of Mr Renals rather than the actual location at which the dancing lessons took place. We now know that classes were at one time held at the Monty Hinds Boys Club. See also Lenton School of Dancing. 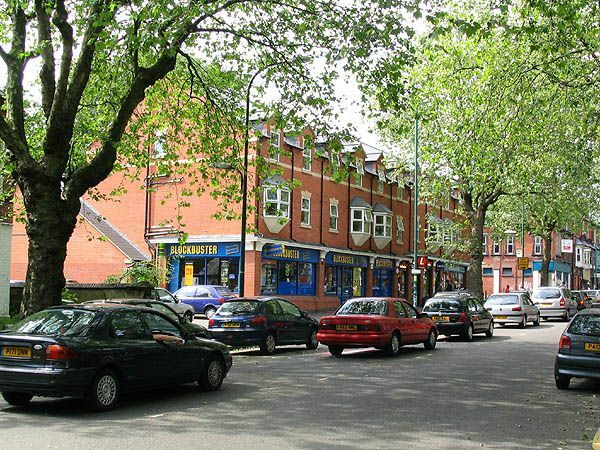 The junction of Lenton Boulevard and Hart Street in 1998. 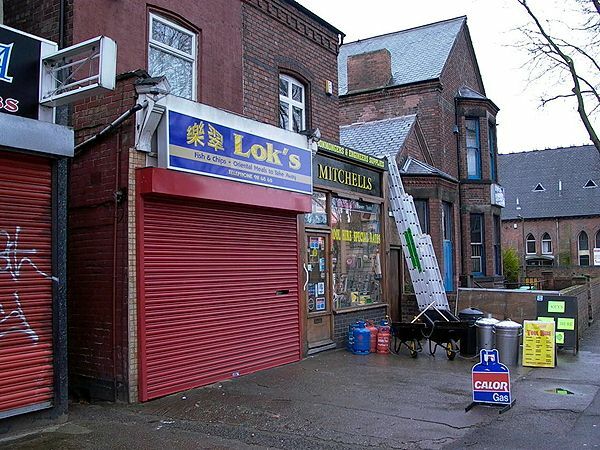 The shutters are down on Lok's takeaway but it would have been open later in the evening whereas Mitchell's ironmongers is very much open for business as evidenced by the products displayed on the forecourt. A feature on Mitchell's shop is featured in Issue No. 14. 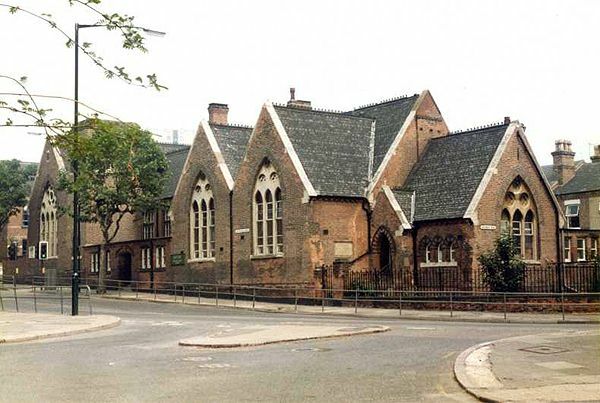 When first opened this building, situated at the junction of Lenton Boulevard and Sherwin Road, housed the Lenton Unsectarian Schools. Latterly it housed Edna G. Olds Nursery annexe. 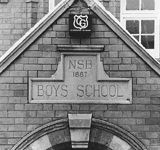 However the nursery has now incorporated into the main school building on Church Street and the old school property has been sold on for alternative use. Photograph taken in 1986. 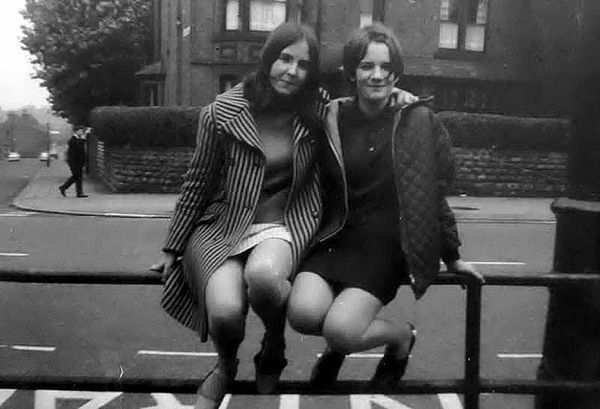 Elaine Walker and friend perched on the pedestrian barrier beside the Lenton Boulevard exit from Cottesmore Girls School. 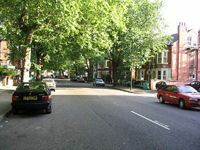 On the extreme left can be seen the junction with Dunlop Avenue. Photograph taken in the mid 1960s and is reproduced courtesy of Paul Walker, her brother who now lives in Canada. 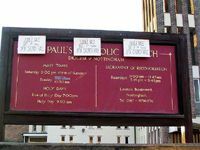 Paul has his own personal website Paul Walker's Nottingham from which this photograph was taken. On the right is part of the Marcus Garvey Centre housed in a portion of the old Raleigh head offices. Police were called out to an attempted burglary in one of the houses on the left of the photograph which subsequently led to the shooting of PC Rachel Bown over in Radford on 14 February 2006. An aerial shot showing this portion of Lenton Boulevard in 1931. The Raleigh offices had just been built and the Cottesmore Schools, visible in the foreground, were also nearing completion. This is a portion of an aerial photograph that appeared in Lenton Times No.22. 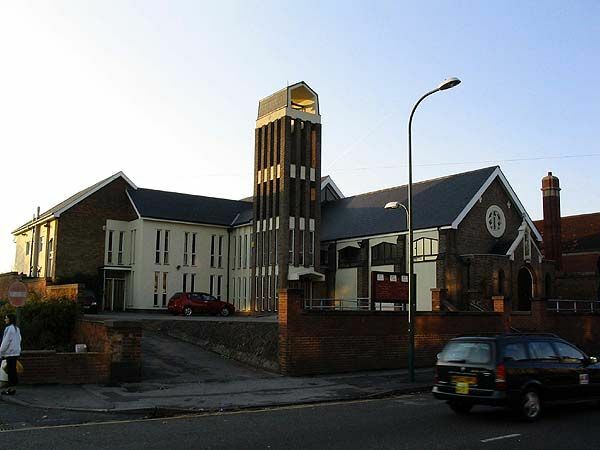 Exterior view of St Paul's, Lenton Boulevard (on 1st November 2003) . There has been some rebuilding over recent years. 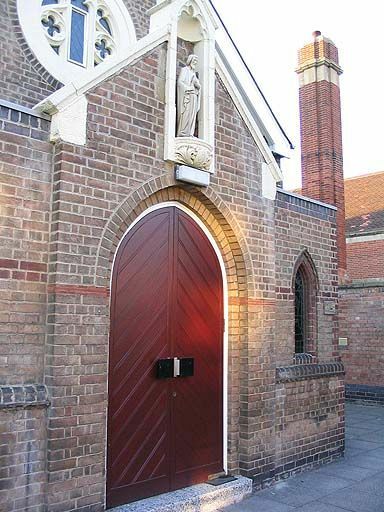 The entrance and main part of the church are original, with the tower and adjoining hall added more recently. 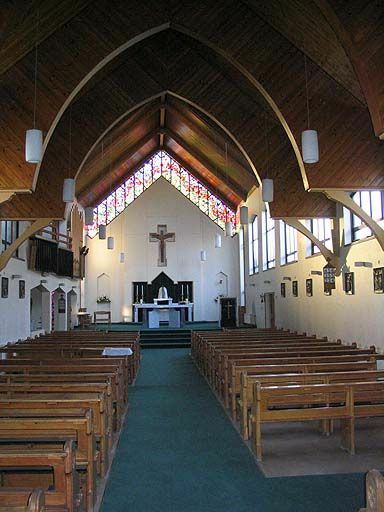 Interior view of St Paul's - looking towards the alter. 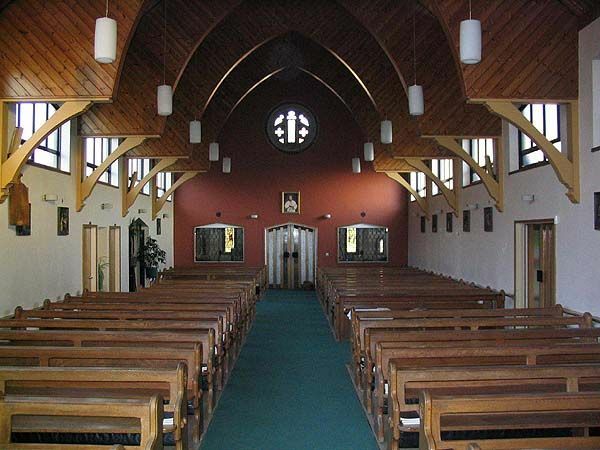 The original part of the church has the arched roof supports. 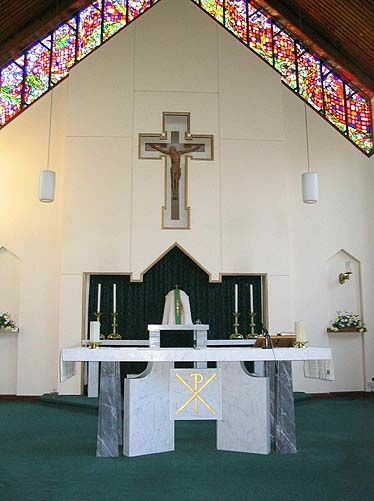 The new part of the building can be seen around the altar area. 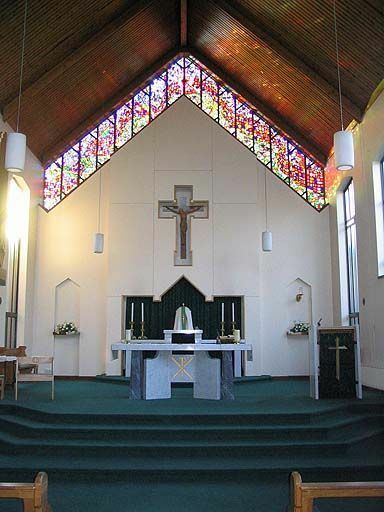 Interior Views of St Paul's - looking towards the altar. This section is relatively new. Interior View of St Paul's - looking back towards the entrance door. 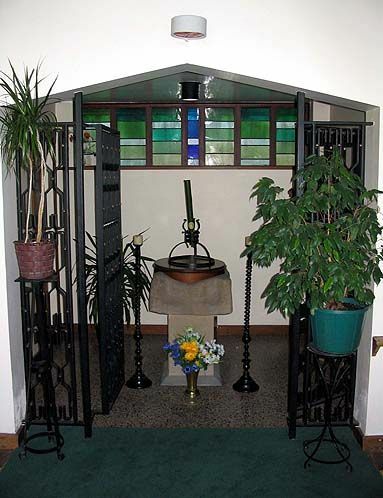 The small chapel containing the font can be seen on the bottom left. Interior of St Paul's showing the font. 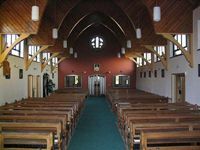 This area is situated to the right of the church, as you look toward the altar. 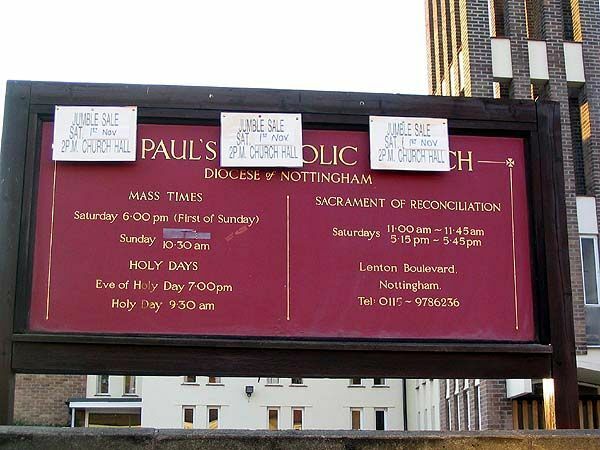 Exterior of St Paul's, showing the church sign - unfortunately covered by adverts for a jumble sale. I found Joan Slote s recollections of visiting in the post office at the junction of Trinity Avenue and Lenton Boulevard most interesting [these are actually to be found on the Trinity Avenue page]. She mentioned the Postmistresses in the 1940s/50s. They were my great aunts, Phyllis and Edna Burn. Their father Walter Burn and his wife Annie Eliza Burn (nee Wilkinson) took on the post office sometime before the 1911 census. I have a copy of the postcard showing the post office in the 1920s and on the back is a note stating that the man standing outside the shop in overalls is Walter Burns. Walter died in 1925 and I believe Annie continued to work in the post office until her death in 1940. Phyllis was her assistant and became the post mistress after her mother's death. Edna the younger sister joined sometime later. Neither Phyllis nor Edna ever married and they lived together their whole lives, remaining in the area after they retired in 1964. I am Susan Brooks née Fox and grew up at 8 Hart Street. My parents were Frank and Phyllis Fox who ran the taxi service mentioned by Joan Slote (see below). I lived at No.8 from 1946, when I was born, until 1964 when I went off to University. I can also add that my uncle and aunt, Birley and Winifred Fox, lived at No.12. Various people lived next door at No.6. I would love to know the names of the two unmarried ladies who lived there in the late 40s and early 50s. I do recall that Arthur and Rose Bee lived there in the late 50s/early 60s. On the other side of us at No.10 were the Kane family who originally came from Jamaica. Mrs. Kane later opened a hairdressing business on Castle Boulevard. The Taylor family who had two boys, Ralph and Brian, lived at about No.20. Opposite them lived two elderly spinsters whose names I cannot remember. Across from Deavin's shop at the top of the street was a house that in earlier times had also been a shop. At the time of the Coronation in 1953 we had a party in their front room for all of the neighbourhood children. The Dimon's had a son, Richard, and the shop was known as Dickie Dimon's, named after the father or the grandfather - I'm not sure which. This reminiscence is also featured on the Hart Street page. 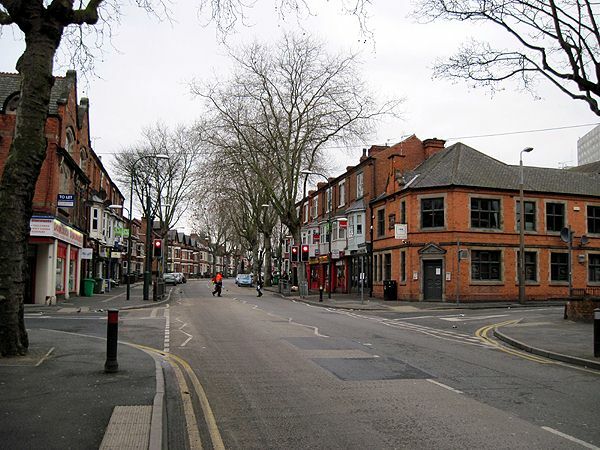 I lived at a house on Trinity Avenue just off Lenton Boulevard and on the other side of the Boulevard from us was the row of shops where Mitchell's the ironmongers can now be found. At the end of the row of shops was Dimon's bread & cake shop. Next door to Dimon's was a greengrocers [whose name escapes me], then there was Sykes' wet fish shop and then the shop now housing Mitchell's - in those days it was Mrs Buxton's hardware shop. She was a friend of my mother's. I don't know if Mrs Buxton owned the business or just managed it for someone else. After this there was the Liberal Club which is still with us. I used to go to school with the Dimons & Sykes' children. At the end of the war I can remember that we would have to queue at Dimon's to get our bread (still on ration!). Mrs Dimon used to take pity on me and feed me extra food as we weren't very well off at that time. I think the butcher's on the opposite side of the Boulevard was called run by the Vernons. The butcher's shop was next to the Post Office. The butcher used to let you have offal when he had some for sale but he rationed it out each week on the basis of which particular letter your surname began with, which seemed a fair system.